To download a free tutorial on how to make Molly Mine Crazy Quilt Blocks please click below. This tip is to show you how to create a quick template! This is very handy when you need to make a photo a certain size so it will fit properly. If you make your template following the directions below and have cut away the paper inside the stitch lines pencil shading you can save the paper with the hole in it then if you have MS Word or similar program you can make a photo fit into it's place with no problems! When you have your photo in the Word program and view it at 100 percent you can hold your template to the screen to see if it will work. This has worked 100 percent of the time for me! Once you think it will fit run a fast draft of the photo image and see if it's the right size, if it is then you can tape a piece of printable fabric over the fast draft photo and reset your printer settings to maximum dpi and reprint the image on the same piece of paper. Make sure your printable fabric is cut larger than needed so your tape won't be covering the printable area, also make sure the tape is laying down smoothly. 1. 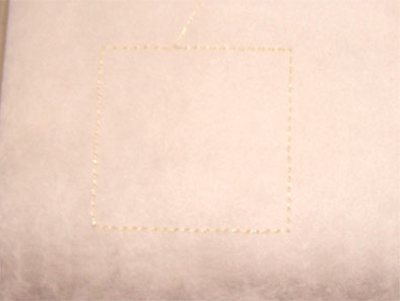 Run your applique position stitch. 2. 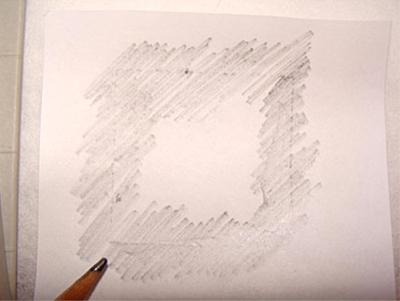 Use tracing paper, or any thin paper and a pencil. Make a pencil rubbing over the applique position threads to make an applique template. With in the hoop designs you will find that if you do not take care of the tie off threads your going to have an unraveling problem. Below I have given an illustration of one of the easitest ways to keep all your in the hoop projects togehter and looking great! 1. 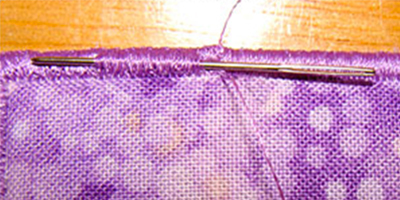 Run a cross stitch or big eye needle under some threads or under the fabric. 2. Using a needle threader, thread the needle with the tie, tie off threads. 3. 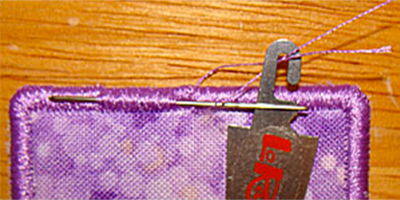 Make sure there is some slack in the thread, then pull the needle through and trim.